I hope everyone had a great weekend – mine was fantastic. Sorry for the absence on Friday; I worked until 2:30 and then decided to clean my apartment and hit the mall for a bit while I waited for Eric to arrive. I ended up making a purchase that I wasn’t expecting to – a new jacket! 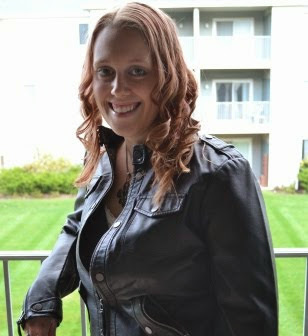 I wasn’t crazy about the length at first, but apparently shorter leather jackets are “in” right now for girls. My favorite ways to wear it are either unzipped, or zipped only partially, like how you see above. I’ve never owned a leather jacket (or faux leather, in this case) before, but I kind of feel like a badass when I’m wearing it . On Friday night we had planned on watching American Horror Story, but unfortunately the season premier wasn’t available online yet so we ended up just calling it an early night and heading to bed since Eric wasn’t feeling very well. This was absolutely fine by me because I was totally exhausted and desperately needed to get some sleep. The early bed time was worth it because we awoke on Saturday feeling rested and ready to carve some pumpkins! First things first – breakfast! I whipped up some pancakes and bacon for us to enjoy, and they turned out good! I used my favorite box mix (Kodiak Buttermilk and Honey) for the pancakes, and cooked up plenty of bacon for my man. Eric must have liked them, because he requested pancakes again on Sunday morning . When we were done eating it was time to carve some pumpkins! That’s Eric busy at work designing his jack-o-lantern. He free forms it every year, and it always turns out looking awesome. As for myself, well, I stick with the patterns that come with the pumpkin carving kit . I love scooping out the pumpkin guts – it’s my favorite part! Part of the reason I like cleaning out the pumpkins is because I get to sort out the seeds for future roasting! As always, Mikey wanted in on the action. By the way, thanks for all of your advice about getting a second cat. I really, really, appreciated it. I’ve taken all of your suggestions seriously and am still contemplating what to do. I’m thinking about giving it a few more months to see if he mellows out, and if not then I may try fostering another kitty. We’ll see! When we were done scooping, we took a break for lunch. Just canned soup + some amazing garlic butter bread that Eric made. We ended up snacking on that bread all day…it was so good! Then it was time for carving! And here they are in the dark! Eric’s is on the left, and mine is on the right. Doesn’t his look like it was done from a stencil? It turned out so good! I used a pattern and I still messed it up. No surprise there, haha. I’m off to work, but I’ll be back tomorrow with more fun from our weekend!